but that doesn’t make it right by the Torah). gravedigger to have his mother reburied in a Jewish cemetery despite a small tattoo on her behind. time, their distaste for tattoos was presented as scriptural doctrine. 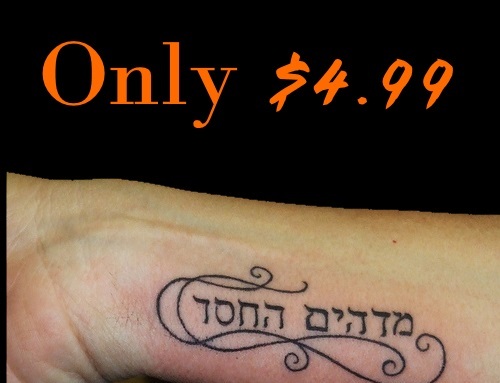 among Jews: that rabbis disagree about just how bad it is to get inked. is that Jews were involuntarily marked in concentration camps. him to get the first of his three tattoos, a Star of David and a dove. Cincinnati and is writing his thesis on tattooing in the Jewish tradition. adornment. Ear piercing, he added, is not controversial. thinks the rule may be outdated. Deuteronomy 4:15, which commands Jews to take care of their bodies, as evidence. law.” As are drinking alcohol in excess and overeating. Jewish friends being tattooed. The group now has 839 members. “hate” inscribed on his feet. Daniel Koffler, a graduate student, draws lots of attention with the Star of David on his muscular bicep. When he got this tattoo four years ago, Mr. Koffler thought he couldn’t be buried in a Jewish cemetery. the Love Hate Tattoo Studio.